This article was published race day, May 30, 1911 in the Indianapolis Sun. It is a mid-race report and the speed to press compromised its accuracy. The glaring error is that it reports that Amplex driver Art Greiner was killed in his lap 12 accident that claimed the life of his riding mechanic, Sam Dickson. The update focused on the events of the day, especially David Bruce-Brown leading at 90 miles. The pace lap went exactly like rehearsal the day prior, according to the report. 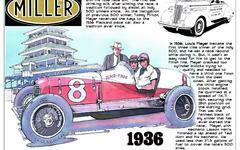 As in many reports it is evident the pagentry of the Indianapolis 500 was vibrant from the very beginning. Aerial bombs, bands, international flags.